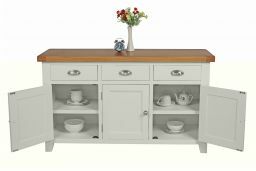 The stunning putty grey painted Country Cottage 140cm Sideboard. 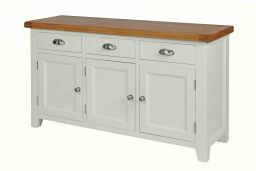 This sideboard is an excellent addition to our Country Oak Painted Range which we offer many different products in such as dining tables, bar stools and sideboards. 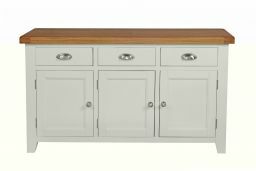 The Country Oak grey painted 140cm sideboard is manufactured with a natural American Oak top which is sourced from sustainable forests. 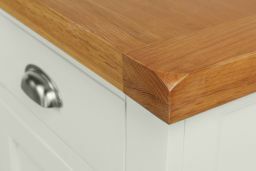 The oak is then beautifully finished with an oiled wax which brings out the natural beauty and characteristics of the oak. Very good value for money. It is a very light grey but that is what I wanted. The storage is good as the shelves are continuous - ie no uprights in the way. 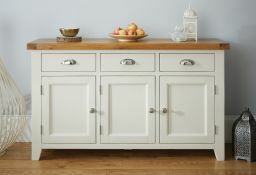 It is perfect for storing the crockery and glassware in our kitchen and looks great. 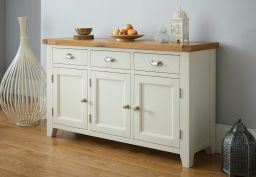 Gorgeous excellent quality and well built sideboard! The colour is lovely although it is a very very light grey which is what I was hoping for but it's hard to tell on the photographs. 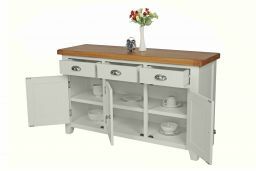 I had excellent service throughout and when I had a query with my product, their communication was excellent and gave great customer service. Would not hesitate to purchase from here again. Really well made. Contacted me to arrange a delivery time that suited. Very happy with the product. 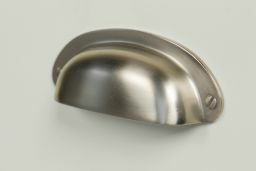 Excellent quality finish & solid build. 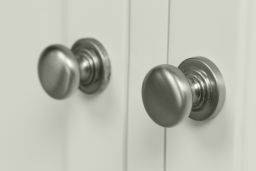 Is exactly what we were looking for. Would highly recommend. Very attractive solid pieces of furniture. Great price, nice character.